The Haikou World Open stepped up a gear for the home fans on Hainan Island in the South China Sea as home favourite Ding Junhui battled to a 5-4 victory over Michael Holt. However, Chinese teenage hope Lu Haotian was demolished by Mark Selby 5-0. The crowds at the event were sparse for the opening round but all their support was needed to help Ding Junhui see out a final-frame decider against the world No. 27 Michael Holt. Ding, the world No. 8, was never behind in the tie but could not relax either as the Nottingham player, after going 2-0 down, pegged him back to 2-2, 3-3 and then 4-4. But Ding’s 50 break in the ninth frame got him over the line and into the last 16 where he will face Marco Fu or Mark Williams. Despite the match turning into an arm wrestle, Ding can be buoyed by his form in the early frames as he made breaks of 76 and 95 to set up his lead. In the decider Holt had his chances but he left a red along the cushion in the jaws which allowed Ding to take victory. "Michael played well and I did well in several frames," Ding said. "It’s hard to play your best during the opening match of a tournament. But I’ll try my best. I’m still bothered by jet lag and I have to go to bed early in the evening." 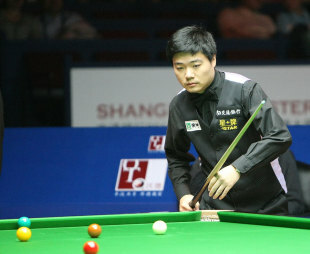 Ding’s compatriot Lu Haotian amassed a total of 86 points in his match as he was left in his chair for large swathes. Mark Selby knocked in breaks of 52, 69, 73, 57 and 73 in booking a meeting with Barry Hawkins, his conqueror at last year’s World Championship, after he beat Ian Burns 5-1. "I thought I played quite well and I didn’t give my opponent many chances," Selby said. "Lu is a very good player and he’ll learn a lot in the next three to four years, and maybe he can be a top-16 player like Ding. The conditions here are better than they were last year, although it might get more difficult as the week goes on. If I play like I did today I’ll have every chance." Later in the day, John Higgins booked a last-16 meeting with Stuart Bingham after beating Alan McManus 5-3. "I’ve played Alan so many times over the years and he’s always a tough opponent, especially as he has come back into a bit of form, so I’m very happy," said Higgins. "The playing conditions are very good, there are too many flies but I don’t think there’s anything you can do about them!" Stephen Maguire was also victorious, the Welsh Open champion getting the better of Marcus Campbell by the same scoreline as Higgins. He will now face Ricky Walden. Elsewhere, Mark Williams was dumped out of the competition in a 5-2 defeat to Marco Fu, the Welshman eventually coming to rue a missed opportunity to turn the match 3-1 in his favour as his event came to an end. Fu, who will now face Ding Jinhui, said: "This is a great chance for us to play an excellent match in front of fans back home. We met in the Masters final in 2011, but I have not played him since then. "I do not concentrate on the draw because they are all tough opponents, even the qualifiers are hard to win. People may think renowned players have a better chance but the less known players are tough to beat as well."